(iii) to enable Te Awe to communicate with me for any purpose. (b) The personal information provided in this application is collected by and held by Te Awe whose address is P O Box 24107, Wellington. (c) If I fail to provide any information requested in this application Te Awe may be unable to renew my membership and continue to provide services to me. (d) I have the right under the Privacy Act 1993 to obtain access to and request correction of any personal information held by Te Awe concerning me. This form constitutes a Tax invoice when payment is received. GST Registration No. 78 887 133. Please retain for your records. * Tick Āe below to agree. 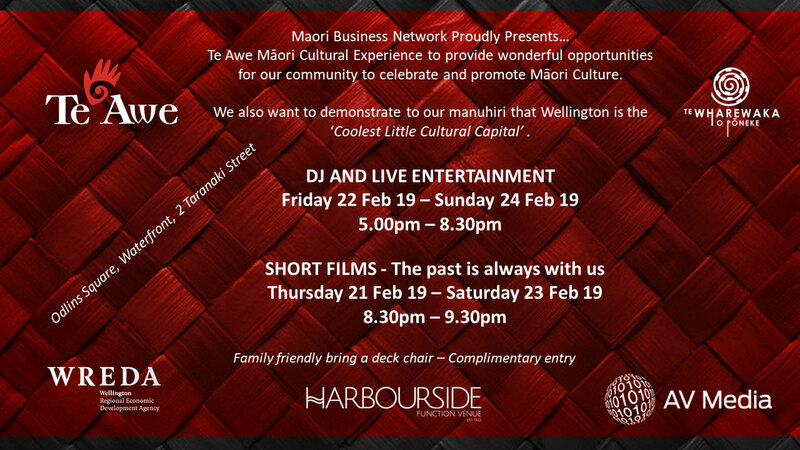 I do hereby give permission to Te Awe Wellington Maori Business Network, its agents, and others working under its authority, full and free use of video/photographs containing my image/likeness. I understand these images may be used for promotional, news, research and/or educational purposes. I hereby release, discharge, and hold harmless Te Awe Wellington Maori Business Network and its agents from any and all claims, demands, or causes of action that I may hereafter have by reason of anything contained in the photographs or video. I do further certify that I am either of legal age, or possess full legal capacity to execute the foregoing authorization and release.